Having spent eight years living with my grandparents in this apartment, their house was very much my beloved home. But in time and after their passing it began to feel like a weathered photo album that needed a new cover. I was faced with the difficult task of transforming a space full of memories into my own home. I wanted to maintain the integrity of their design but to inject the space with modernity via new finishes, fabrics, furniture layout, artwork, accessories and some new furniture. 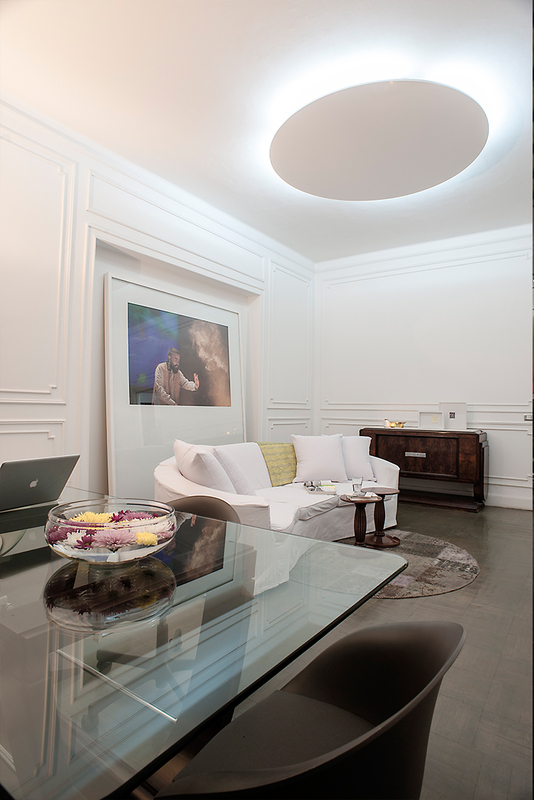 I wanted something elegant and minimal, but most importantly for my work, I needed a space that was visually quiet. I stuck to a strict gray and white color scheme, not including the wooden furniture and artwork. One of the most visible changes is the grey dyed parquet floor that transformed the feel of the space. While the 1940s Egyptian Art Deco dining table and couch would happily accommodate my entire family for our weekly dinners, I had a different lifestyle than my grandparents’ and found new ways to appreciate their sizable furniture. 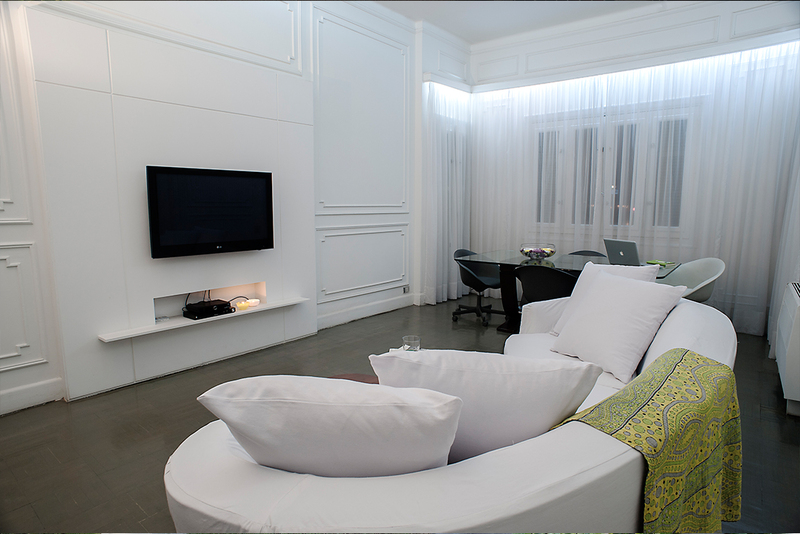 The table became a workspace that overlooks the Nile view, while the beloved couch got pushed to the center of the room for the best TV watching experience. Despite the authenticity of the furniture items, all the wood was a bit too much for me so I opted to mix up the materials a bit. For the dining table I removed the wooden top and edited the base to support a thick glass top, bringing a new energy flow to the room. Moreover, the glass top better exposed the beauty of the piece. To contrast the age of the table, I accessorized it with four Vitra chairs, which are very similar in shape to the couch and are comfortable for both lounging and work. The large side buffet was removed from the room and smaller one was turned into storage unit for the office. Taking away the black marble, I replaced it with a honed Turkish Carrara marble. Complementing the Art Deco furniture, I designed a round shiny drop ceiling reminiscent of the style and accented it with a similar shaped rug from Zimmer. The ceiling brings much needed light to the room and the backlighting against simple white voile curtains furthers the modern feel. The two small coffee tables were renovated. The original pieces had legs and a marble top, however I preferred removing the legs to make the table double as a stool and to expose the woods joints on the top. 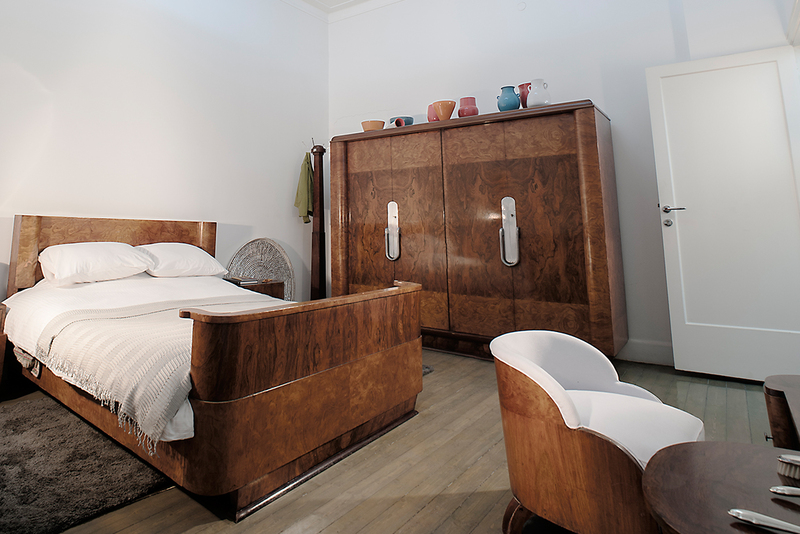 The bedrooms were also filled with a beautiful collection of 1940’s Egyptian Art Deco pieces. 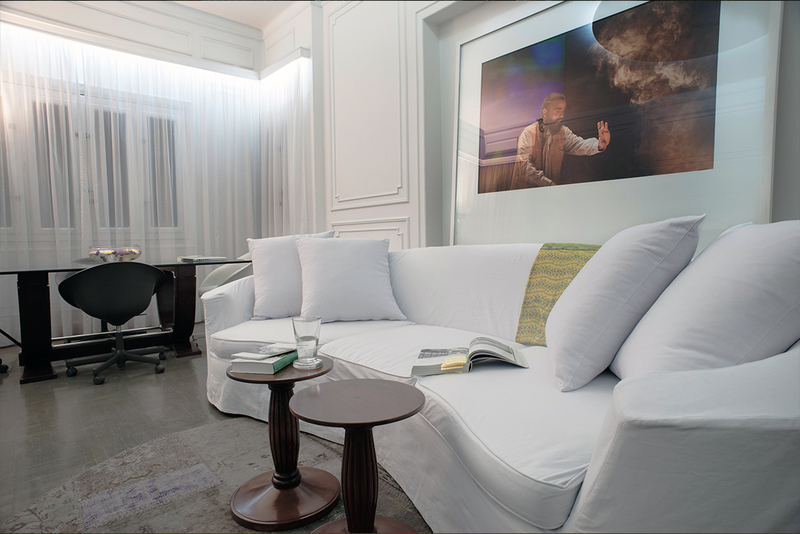 Using the same concept as the living room, the floors were dyed and all fabrics changed to white. 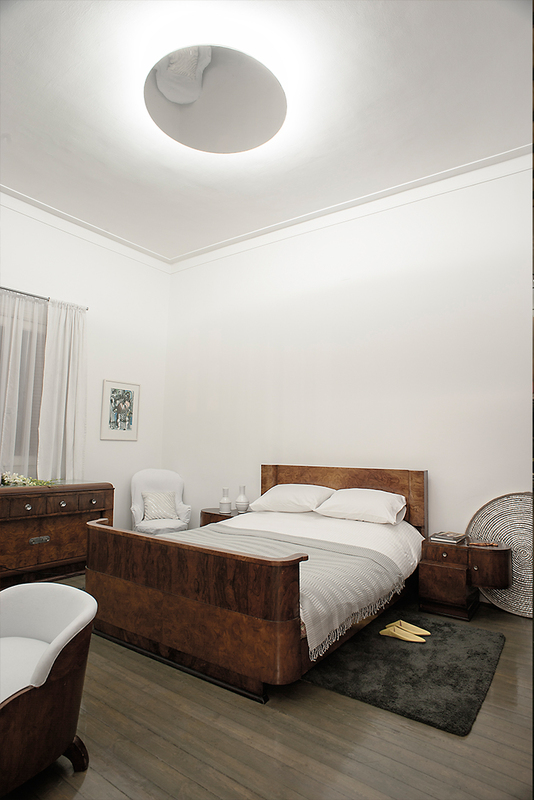 The round stainless steel drop ceiling above adds more light to the room and accentuates the overall Deco feel, as does the armoire. A focal point of the living room is the photograph by Karim Mansour, which somehow made me want to party and meditate at the same time. The massive frame eludes to a dj box and brings focus to it. With so much beautiful artistry in Egypt, it’s easy to accumulate pieces. 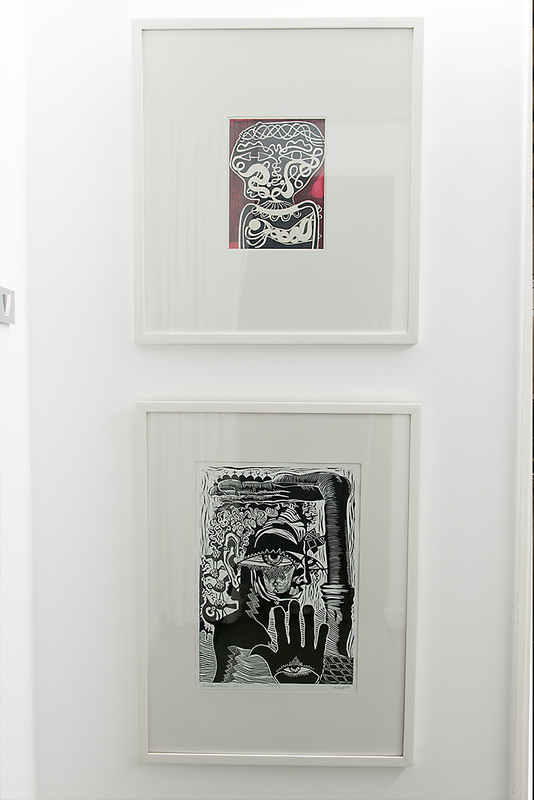 Having purchased a variety of artwork, I wanted to unify them all somehow and framing them all in a clean white wood, with thick borders, brought them together cohesively. In the bedroom are typical Egyptian water storage bottles that I designed myself, while the massive round tray, made from recycled potatoes chips covers, makes for a convenient surface to work or enjoy a snack on.